In previous Sugarloaf Regional Trail listings, this was a circular trail; however, the Baltimore and Ohio Railroad (B&O) no longer permits access to the tracks which formed a major part of the original loop trail. Even without this section, the Monocacy Battlefield Tour is well worth doing and the historical research is invaluable. The National Park Service operates the battlefield and recommends no biking anywhere in the Battlefield area. Several places require foot traffic only. The Battle of Monocacy, fought July 9, 1864, marked the last attempt by the Confederacy to carry the war to the North, and the Confederates nearly succeeded in overpowering the defenses of Washington. In a bitter day-long battle in the fields southwest of Frederick, some 14,000 troops under Lt. General Jubal A. Early overwhelmed Major General Lew Wallace’s Union force of about 6000, although not without suffering heavy casualties. But Wallace’s determined resistance bought just sufficient time to allow reinforcement of the lines around Washington, thwarting Early’s plan to take the Capital. At the time of the attack, the defenses of Washington had been stripped to aid Grant’s campaign against Lee at Richmond, Virginia. Early, having cleared the Shenandoah Valley of Union troops, drove north into undefended Maryland and swept east along the National Pike (now Route 40-A) through Boonsboro and Middletown to Frederick. Wallace was guarding Frederick Junction because it controlled the main roads to Baltimore and Washington and the vital Baltimore and Ohio Railroad line to the West. But he had only 2,500 green troops to do the job. Early must have expected to sweep Wallace aside with little difficulty. At any rate, he spent much of the morning of July 9 in Frederick, collecting a $200,000 ransom and supplying troops with new clothing and food. It turned out to be a more difficult and costly battle than expected. The night before the attack, Wallace was reinforced by 3350 men of Major General James B. Ricketts’ division, a small force of combat-tested veterans, dispatched from the Richmond front to Baltimore by ship and then to Frederick Junction on the B&O. Both sides suffered heavy losses. Each side counted over 700 dead and wounded, with many more stragglers. Major General John B. Gordon’s infantry overwhelmed the Federals and opened the road to Washington. But Wallace’s defense slowed the Confederate advance by at least 24 hours, giving General Grant time to reinforce the lines around Washington. As a consequence, Early was unable to carry out his bold design and after a show of force at Ft. Stephens in Washington, was compelled to retreat across the Potomac. Writing his memoirs, Grant observed that Wallace in his defeat had done more for the Union cause than many a victorious commander. The tour begins at the Monocacy Battlefield Visitor’s Center, 4801 Urbana Pike, Rt. 355, Frederick MD, open daily from 8:30am to 5:00pm. Call 301-662-3515 for detailed information. The park rangers give frequent explanatory lectures on the deck overlooking the battlefield. Also on this level is the Battlefield Museum. Across from the Visitors’ Center is a pull-out for parking to visit the United Daughters of the Confederacy commemorative statues . A few hundred yards south of the Visitors’ Center is a small road on your left leading to a parking lot for about a dozen cars, maintained by the Park Service for fishermen. A poorly marked trail lined with 6 foot high weeds in the summer leads to an abandoned railroad station made of huge stones fit together with no mortar. Here an intriguing viaduct carries trains across the Monocacy River, a wild and lovely spot lined with trees. Past the railroad there is no trail. Several hundred yards east, The B&O line from Baltimore on its way to Point of Rocks crosses the Monocacy River and makes a left turn. There is a branch to the west that serves downtown Frederick: hence the name Frederick Junction. All these lines are very close to their location in 1864. General Jubal Early’s troops marched South along Urbana Pike. They met with a determined defense by Major General Lew Wallace, the Union commander, headquartered in a house south of the railroad. But the opening shots of the battle – extremely accurate artillery shells – killed several men and forced Wallace to shift to a more sheltered position on the bluffs overlooking the river. From this point he watched the engagement unfold. Within the triangle bounded by the highway, the railroad and the river, 1st Lt. George E. Davis and 5 men of his 19th Vermont Volunteers distinguished themselves in day-long combat against immensely superior Confederate forces. Accompanying them were other troops. Soon Davis’s men were alone, opposed by a whole division under Major General Ramseur. At length Wallace ordered the covered bridge over the Monocacy burned to prevent its capture. Still Davis and his men held on, protecting the railroad bridge, until 3:30 pm when they saw the rest of their division, on the other side of the river, begin to retreat from the battlefield. Only then did they yield the triangle and dash to safety across the railroad bridge. For his gallantry, witnessed by Wallace from his command post, Davis won the Congressional Medal of Honor. Few traces remain today of the structures within the triangle that were there in 1864, although the basic layout of rail lines and highways and bridges is unchanged. At the time of the battle there was a large palisaded blockhouse near the highway, commanding the approaches to the bridges. It too was burned during the battle, and no trace of it remains. Confederate Strategy: Virtually all of Wallace’s troops were posted on the hills and river terraces south and east of the Monocacy River. Because of the strength of this position, Confederate cavalry probed to the west and south in an effort to turn the defenders’ left flank and open the road to Washington. They made their first crossing a little over a mile southwest of the present Monocacy bridge. 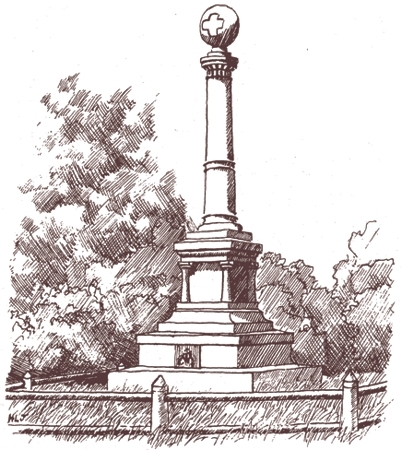 Drive south on 355, turn right onto Araby Church Road where battle monuments commemorate the 10th Vermont and Pennsylvania regiments. From the Vermont monument you will find a fine view of Araby. At the time of the Civil War, Araby Church Road was the extension of Georgetown Pike. Most of the Federal infantry retreated north across Bush Creek and then to the Baltimore road; Col. Clendenin’s small cavalry unit went south toward Urbana to cover the Union flank. Turn right onto Baker Valley Road. Proceed to the entrance of the Worthington Farm and hike along the gravel road into the farm. Across the river you can see the former Best farm where Confederate troops marched south and forded the Monocacy. The Worthington-McKinney Ford was the key to the battlefield and Jubal Early ordered an infantry division to cross onto the Worthington Farm under Brig. General John McCausland. The Worthington farm soon saw some of the day’s bloodiest fighting and served as a staging point and hospital for the Confederates. 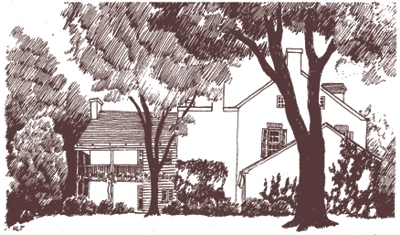 McCausland’s men formed in line of battle near the John T. Worthington house, then advanced toward the crest of a low rise which divided the Worthington farm from Araby, the Keefer Thomas Farm. Concealed in waist-high corn on the Thomas property lay the 3350 men of Major General James B. Ricketts’ Union veterans. They waited cool as the river itself until McCausland’s 800 men came within 150 yards, then rose as one man and fired a murderous volley. 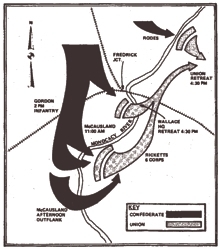 The Confederate line buckled and the survivors fled in disorder, pursued by the Northerners. McCausland managed to rally his men for a second attempt, but they retired once again as they met Union fire. Reverse your route, then left at the Worthington Farm and left again into the Thomas Farm. This area became the focal point of the battle. The knoll around Araby saw very heavy fighting that continued until the Union lines were broken. General Gordon noted in his official report on the battle that the little stream that runs through Araby was dyed red for 100 yards by the blood of the many soldiers on both sides that were slain or wounded on its banks. Throughout the battle, both these old houses sheltered in their basements the families of their owners and other nearby residents. All the civilians emerged unscathed although both houses were greatly damaged. Exit Araby and turn right onto Baker Valley Road where you may view some of the loveliest rural scenes on the East Coast. After crossing the Monocacy on Fingerboard Road, turn right onto Michael’s Mill Road and into Buckeystown. This section was once part of the great Manor of Carrollton, home of Charles Carroll, one of the signers of the Declaration of Independence. Michael’s Mill Road follows the original stone road built by slaves to facilitate the transport of flour from Michael’s Mill (also known as Monocacy Mill) to the railroad. This was the largest of the many mills along the Monocacy and its tributaries at the turn of the 20th century. After the coming of the railroad, the mill was greatly enlarged and began a brisk export trade in flour to Europe and South America. Just past the ruins of the mill dam is the old mill and above the road on the right is the miller’s house, a fine old stone mansion. Proceeding into Buckeystown, with Carroll's house on your left, turn right onto Route 85. Many Buckeystown buildings date from the early 1800s and a few go back to Revolutionary times. You immediately cross a little brook: adjacent to this ran the B&O spur track that served Buckeystown. Until about 1955, Buckeystown contained several large canneries to the left (now assorted industrial buildings) and a large brick manufacturing yard including kilns, the remains of which you may see on the right (now a conference center). Proceed North on Rt. 85 out of Buckeystown to the settlement of Lime Kiln where McCausland re-formed his remaining cavalry, crossed over to the east bank of the river, and set off on a ride around Union troops. The trail ends here, as the B&O Railroad no longer permits hiking along the track for security reasons. Continue north into Frederick, or turn around to go south to Washington or to return to Route 355 by way of Michael’s Mill and Baker Valley Roads. Early had wanted to uncover the route to Washington and had little interest in pursuing the beaten Union troops. As soon as the fighting subsided, he crossed his entire force over the Monocacy and went into bivouac in the ravaged fields around Araby and Gambrill’s Mill, located just north of the Monocacy River Bridge on 355. Before dawn on July 10, 1864, Early put his weary columns on the march again, toiling south toward Rockville and the gates of Washington. The present highway bridge over the Monocacy is partly built on the foundations of earlier bridges. The 1864 bridge was a wooden covered bridge, burned during the battle to prevent Ramseur’s division from advancing across it and breaking the Union line. Just south of the bridge, the uplands on both sides of the road were laced with Union rifle pits, which have since disappeared. On the left is an old dirt road, now hidden and full of poison ivy, that ran west and south to the Worthington house. To see the old hand drawn Trail Guide site maps for the Monocacy Battlefield Bicycle Trail (now out of date), please go here.